Scroll Down Below For Team Pictures, Past & Present! Being a small community, it is a great achievement when any of our teams win or participate in a Championship game. This page contains the successes our children have accomplished over the years. 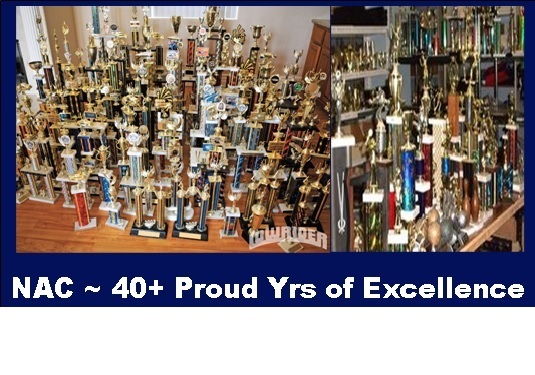 Below is a listing of Trophies and Awards that are displayed in our field house. We CONGRATULATE all those who participated or coached on the following teams. 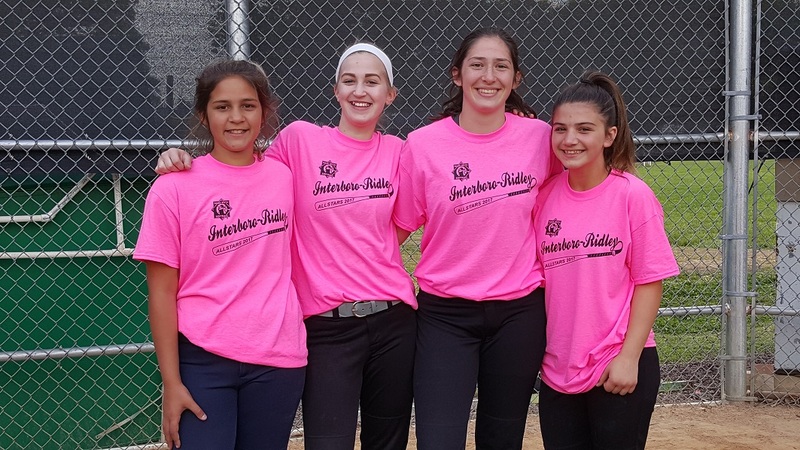 1990 DelVal Softball Intermediate "A"
1992 DelVal Girl's Softball Midget "B"
1994 DelVal Softball Intermediate "C"
The middle of June brings exciting times for children. 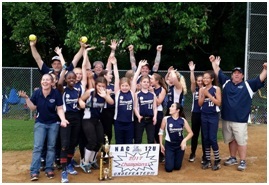 The school year ends, swimming pools become crowded with the joyous voices of our little ones, and youth baseball and softball teams make their runs for post-season glory. 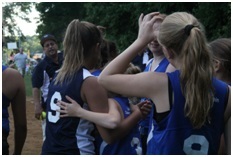 Although youth sports sometimes brings out the best and worst of people through competition, real life lessons that should be taught are sometimes overlooked; making friends, having fun, and the true meaning of sportsmanship. As the 2017 season came to an end, one particular game stood out from the rest. 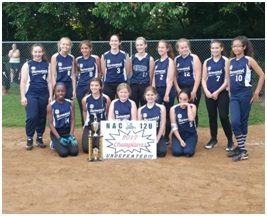 It was a 12 & Under girls championship game in the Interboro Babe Ruth Softball League. 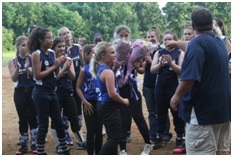 On Wednesday, June 21, 2017, Prospect Park Youth Club's 12U girls had high hopes of ending Norwood Athletic Club's undefeated season. 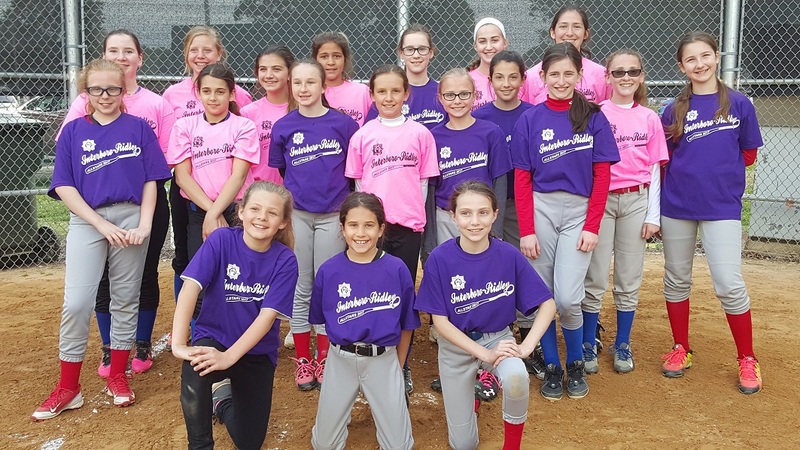 They traveled a few short blocks up Chester Pike to Norwood's Amosland Park, bringing with them a group of dedicated coaches and players, equipment, and scores of fans. But their journey also contained something so special that one might live an entire lifetime and never witness it again. As the game began at 6 o'clock, clouds were building. The entire second inning was marred by steady rain. The teams played on through the rain, and the sun rapidly emerged. Norwood only held the slightest of leads into the final two innings. The field started drying out, but would soon dampen up for an entirely different reason. 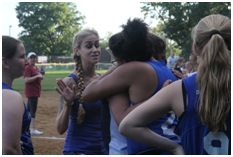 Prospect Park courageously gave everything they had in their quest for the first place crown. But in the end, Norwood held on to win. There was, however, one last "play" Prospect had not yet executed. The evening was no longer about winning, losing, or undefeated seasons. 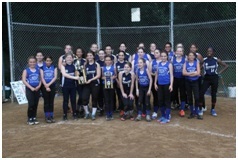 Before league representatives handed out trophies to both organizations, a heartfelt announcement was made by Prospect Park's Head Coach, Shawn O'Shea. Coach O'Shea told the crowd his team had something very special for a player on the opposing roster. He briefly described the reasoning behind the gift as an effort spearheaded by his wife, Kim O'Shea. A soon to be stunned crowd would later view this as the ultimate gesture of respect. 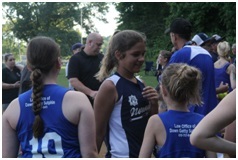 Two of Coach O'Shea's Prospect Park players, his daughter Erin O'Shea, as well as Emma Nagle, stepped forward. Each girl carried a large, beautiful bouquet of flowers. 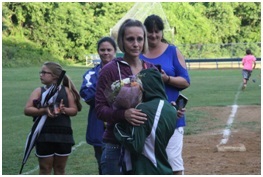 They were presented to Norwood infielder and pitcher Olivia Halliday, and her younger sister, Kyleigh Halliday, who was cheering for Olivia that night. The sisters had been enduring a rough period the past few years. Their father, James "Jamie" Halliday, a life-long member of the NAC family, had been struggling with cancer. 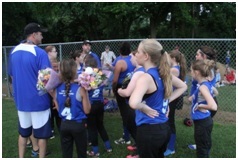 Jamie had just recently lost that battle, and the girls attended his funeral only a few days prior to this game. Olivia thankfully accepted the flowers as she fought to hold back an onslaught of tears. She received a hug and a kiss on the forehead from her coach, Ken White, and graciously thanked Prospect again as they hugged her one by one. There was no way the field was going to dry anytime soon. Well over one hundred onlookers from both clubs experienced a swell of emotions. They just bore witness to a selfless act of kindness and compassion. 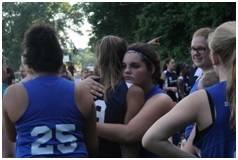 An opposing team of young ladies, in the wake of an emotional loss in a championship game, consciously chose to soothe the heart of their victorious opponent for a loss that truly mattered in life. It does not get any better than something of this magnitude. 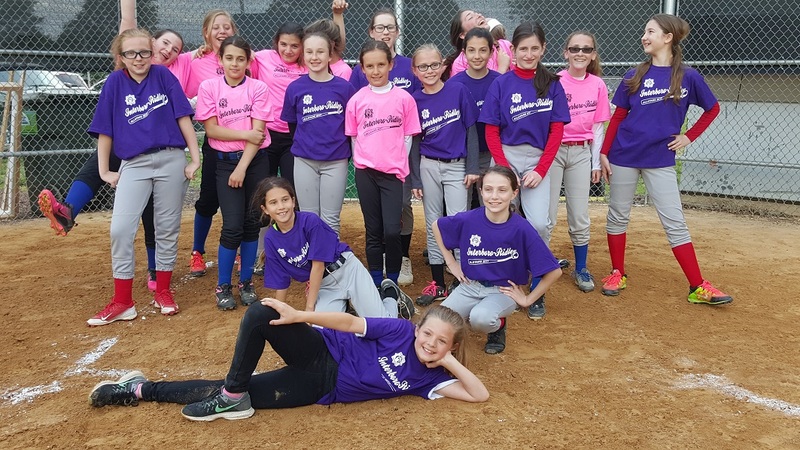 Prospect Park's 12 & Under Girls Softball Team for 2017 should be an inspiration to us all, especially in the eyes of defeat. The lessons learned from one simple summer evening could not be clearer. All of humanity should certainly take heed. This team's classy act proved that everyone, including our children, can be rivals on the field, friends off the field, and good stewards of society wherever we are each day. 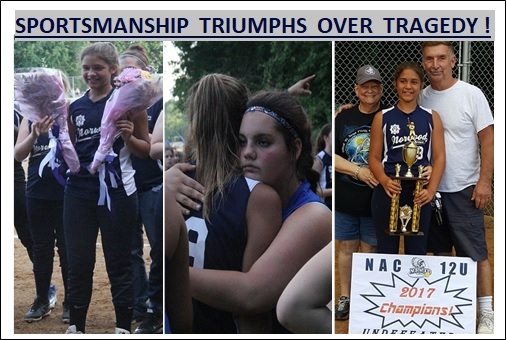 They have become a beacon of light that should shine on three words in the mission statements of every youth sports organization: Friendship, Respect, and Sportsmanship.